Linux is a free, open source operating system. Most of them need to be installed on your hard disk. However, there is a special kind of Linux distributions. They are called Live Linux or Linux Live CD. To use a Linux Live CD, you don't need to install it on your hard disk. What you need to do is just inserting it into your CD drive and restart your computer. (Be sure the first boot device is CDROM, you can configure it in BIOS. To enter BIOS configuration interface, press "DELETE" key when the computer is starting up.) Linux will be loaded into the memory and run. Don't worry, Live Linux won't write anything in your hard disk. So it won't damage your files. After a while, you will enter Linux operating system. 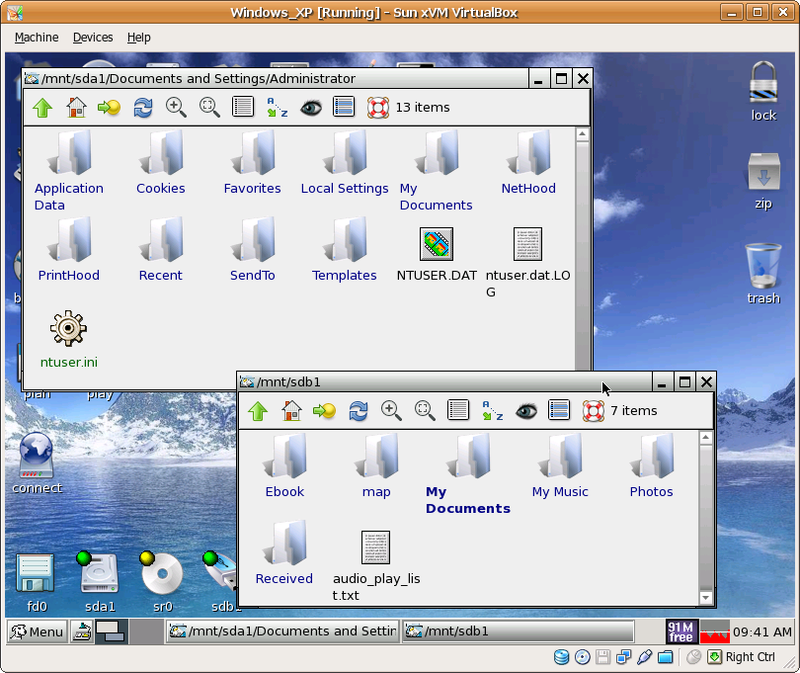 Then you can backup files using Linux software. There are many live Linux distributions. Puppy Linux, Ubuntu, Knoppix... In this article I will take Puppy Linux as an example. 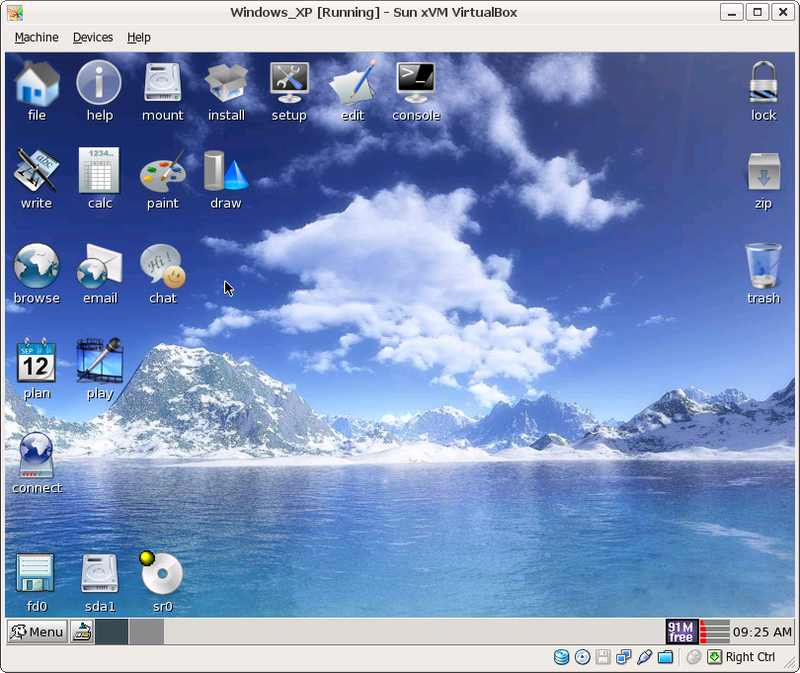 Puppy Linux is a small live Linux distribution but it has many useful software. To use it, you need to download it from its site and burn a CD. Then test it to see if it can run on your computer. Insert the CD into the CD drive and reboot your computer. Make sure the first boot device is CDROM. You can see some boot options. Usually you can ignore them and just press "Enter" to continue. 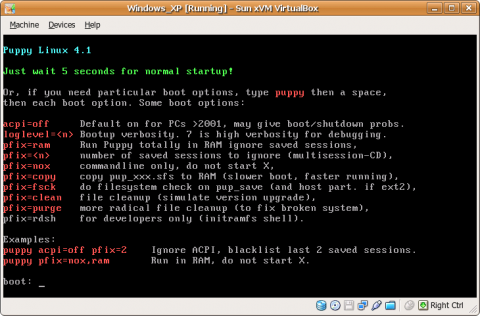 Puppy Linux will run. After a few minutes, a desktop environment will appear. I plan to backup some files to my USB stick. Then insert a USB drive and click the "Mount" icon. After a while can see the USB stick's icon on the bottom line. "sda1" is the first partition of my hard disk and "sdb1" stands for the USB stick. Now open them by clicking the icons. You can copy files from the hard disk to the USB stick by dragging your mouse. It is very easy. For example, copy "My Documents" from the hard disk to the USB stick. After you finish it, right click the "sdb1" icon and choose "Unmount sdb1". It can make sure that the files are written to the USB stick. Notice: some live Linux distributions are not as easy as Puppy Linux to use. You'd better know some Linux commands. For backup, the command mount, umount, tar, cp, dd are very important. Please use Google to learn more or see my articles: Backup Your Files with 'tar' in Linux and Linux Backup: Hard Disk Clone with "dd". 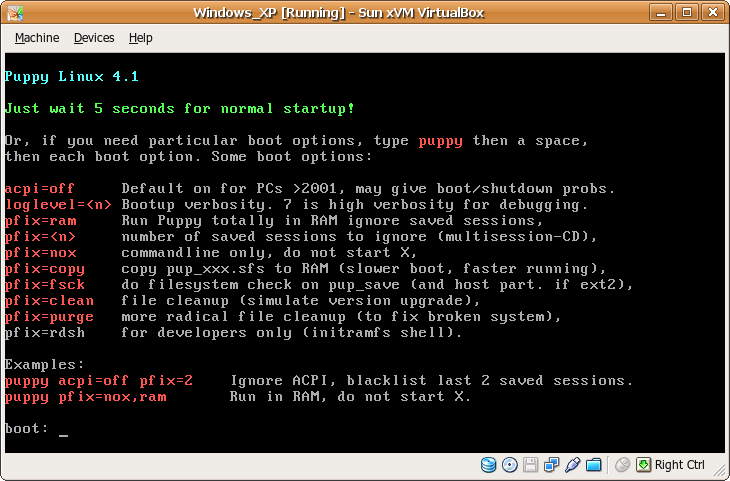 Download Puppy Linux: Click here. « Linux Backup: Hard Disk Clone with "dd"